I have to say that the first few days were a bit hit and miss in Paris. Peter had a dodgy dessert that gave him gastro, Nicola had a couple of meals that had way too much cheese and rich sauce for her, and never having eaten a croque monsieur before, I finally had one and was not very impressed. Add to that the fact that you spend Euros like AUD, and the menu prices don’t include tax, and you start to resent the fact that you’re paying very high prices for sometimes very ordinary food. First great meal is pictured above, sorry I can’t remember the name of the place (near the Eiffel Tower), but the chicken was cooked perfectly, so juicy, and the gravy was fabulous. Didn’t get to try Peter’s prawn risotto, but he polished it off before I had finished my meal, so that’s a good recommendation. Next awesome meal I don’t have a photo of, but was at a place called Cafe l’Atome, 29 Boulevard de Grenelle, also near the Tour Eiffel. I had chicken and lemon risotto, full of cream and dressed with pesto, so rich and yummy, but topped with a mound of rocket that cut the richness just enough to gobble the lot down! I’ll definitely try this one when I get home. 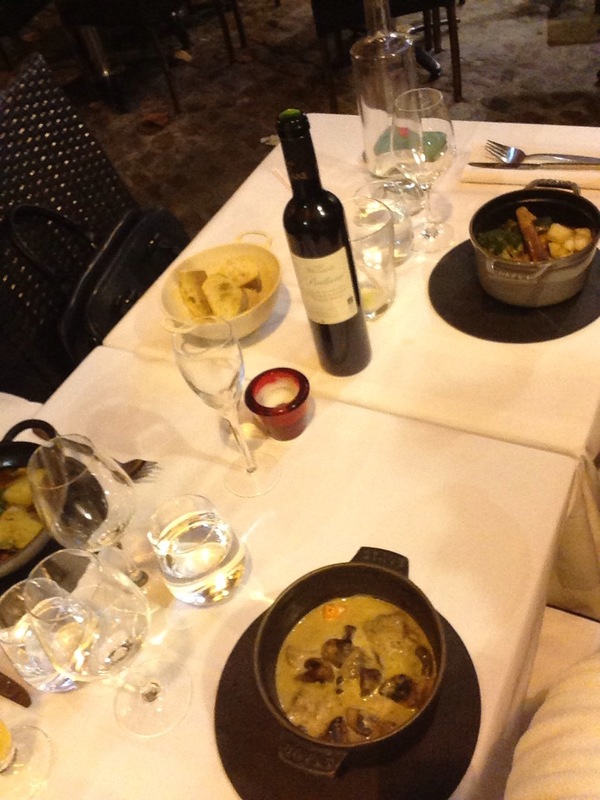 Skip down to Aix-en-Provence, and we have Hue Cocotte, 9 place Ramus, where the meals were mini-casseroles, served in little pots. 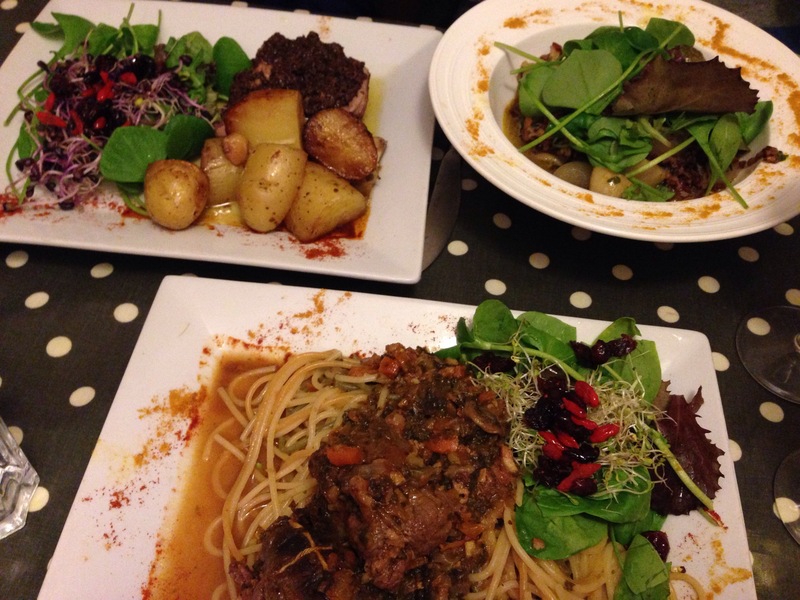 Mine was veal, Nicola’s lamb and Peter’s baby octopus, all top notch and very reasonably priced. But best of all so far has to be la Cerise sur le Gateau, coincidentally right next door at 7 place Ramus. Also coincidentally, we had beef, lamb and calamari, all cooked in completely different ways to next door, and all fantastic meals. 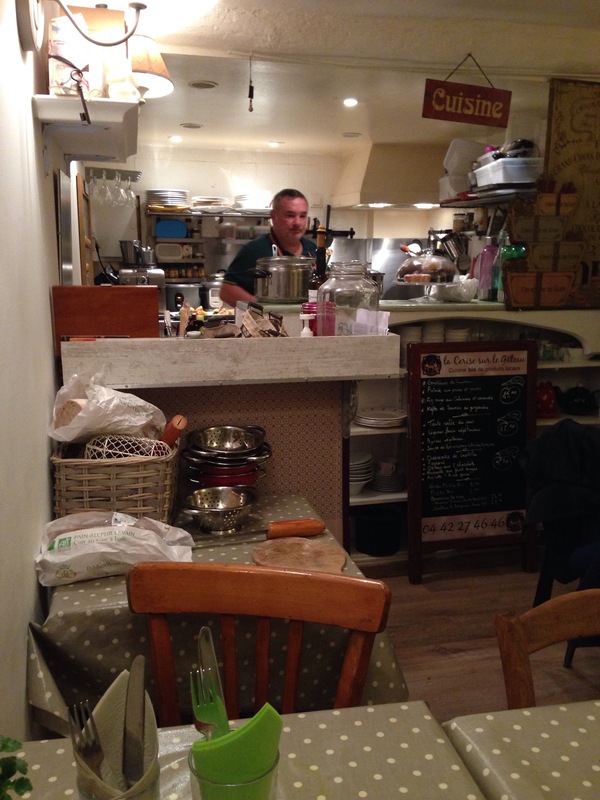 This tiny restaurant is a one-man show, with your host, waiter, chef, sommelier and dishwasher looking after you delightfully, in full view as he prepares your meal at the back of the minuscule space. The restaurant only seats a maximum of 14, so make sure you book, and bring your cash; no cards. 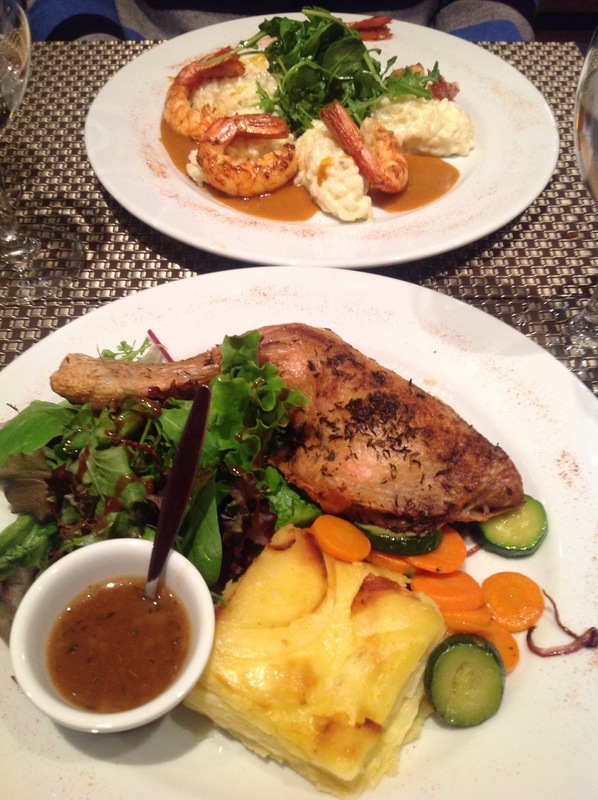 Not that you will need much: we had mains and dessert for 3, plus 2 glasses of wine for €72. And the food! Absolutely divine, with my fussy daughter wanting to take the chef home with her, and all 3 of us waxing lyrical over the meal. Highly recommended if you ever find yourself in Aix. Nice work, if you can get it! I presume the cracker meals did not involve actual crackers – you didn’t mention cheese platters. Mum and I just had sausages and salad, so that seems a little ordinary now! Enjoy your last days in Paris, Euro Disney and wherever else you end up. Hope Nicola has a very happy birthday. Mum sends her love, and so do I! Thanks Loris, we’ve also had quite a bit of cheese, and we also had sausages cooked by Peter one night, that were also fabulous. I’ll let Nicola tell you about her birthday, but we’re planning a special dinner tonight which should be nice. Love to you, Mum and the rest of the family.